The children are finally out of school. YAY! 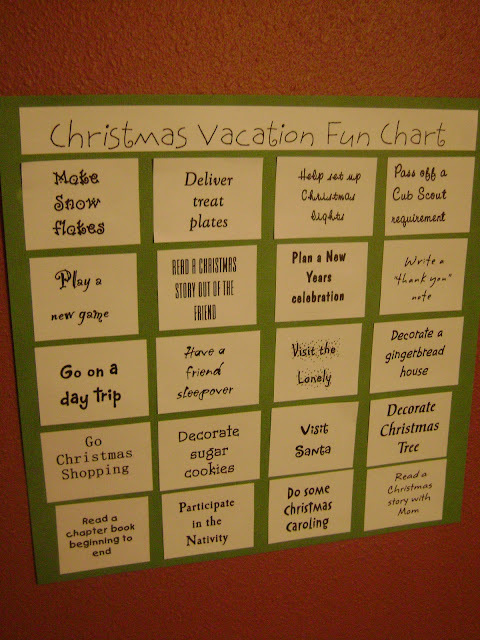 To keep the children focused and having fun, we created this "Christmas Family Fun Chart". I find that if I'm organized things are fun and keep on track...otherwise we end up with chaos and I just can't wait for the kids to go back to school. We are really looking forward to this vacation though and this is just an added measure to keep things fun and have a sort of check list. The activities on this chart are things the children would like to accomplish during their vacation. Take a look!